Last week-end a fellow member of my local chapter of California Council of the Blind went out with her guide dog for dinner. Sadly the party was cut short when her guide dog was denied access to the restaurant. What! I hear you cry. "A guide dog denied access in California?" What happened? In fact they were in a local Native American Casino. The manager of the restaurant in the casino stated that they could not enter the premises of the restaurant and the reason for this was that as a sovereign nation the Americans With Disabillities Act and the access provisions enforcable within the Act do not apply within Native American rnclaves. She and her dog could not enter though the other members of her family were welcome to enter and dine there. Of course all refused and left. I took it on myself to contact Guide Dogs for the Blind in order to clarify the situation. as I had heard rumors on both sides of the argument, as to whether the ADA applies in such sichuations. 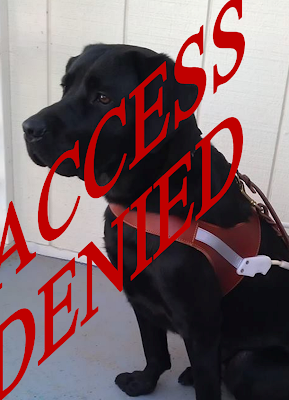 It appears that this is a sad loop-hole in the ADA, Native American Casinos or any business on Native American land is not obliged to allow access to a guide dog. One thing that complicates this loop-hole is that whether the ban is all encompassing or merely at the whim of a manager. 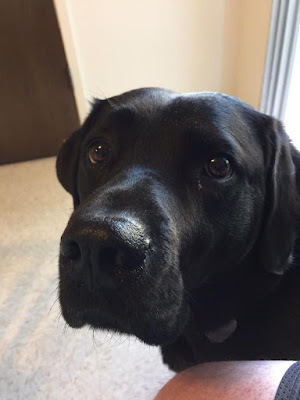 I have visited the same casino with my Guide Dog, I was allowed to move freely around the casino and even to eat there, in one of the restaurants. My visit took place last summer so possibly the rules have changed since. No mention as to when the rule changed has been given. My initial interest was raised when another member of my local CCB told me of friends of hers being turned away from the casino's front door and not being even to enter the premises. Being prevented from enjoying the same access to businesses is very upsetting, it can spoil even the best of days for anyone. But it is also a bad business practice. On this occassion the restaurant lost income from a family with several members. The news spread pretty quickly through our CCB Chapter and we have told people that we all know. A former manager of mine when I worked in retail told me; "Get it right first time, and the customer will tell one or two people. Get it wrong and the customer will tell everyone they know." This may be a slight exageration but think of how many times you might have complained about poor service in a business and how often you might have cheered a business for doing the right thing and serving you well. If you are thinking of visiting a business on Native American land. Do not expect the Americans with Disabillities Act to be honored. If you use a guide dog, check for access rules on Native American land. Bare in mind that rules may be discretionary, what one person allows another may not. Hope to pursuade the managers of these businesses that blind and visually impaired customers are good customers. If you have a bad experience then tell as many people as you can. A few hours after this post originally appeared, I received notification that one of the elders of the tribe contacted the family involved. The elder apologized for the mistake and invited the family to return to the casino and the restaurant for a free meal, cortesy of the tribe. That was a good gesture. But how much nicer would it have been to ALL concerned not to have this situation occur in the first place.